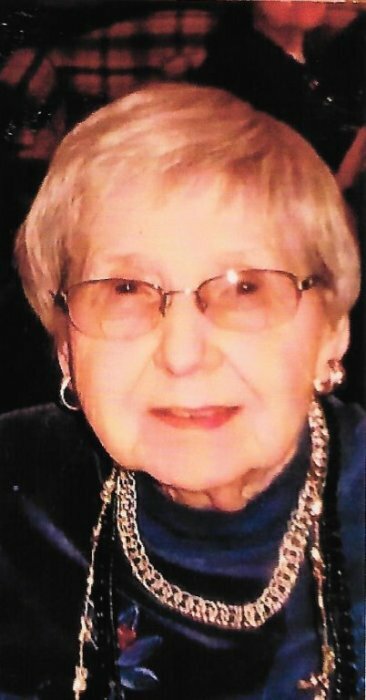 Mary “Frankie” Verville, 98, long time resident of Hancock, passed away early Friday morning at Portage Pointe Nursing Home. She joins her husband of over 60 years, and her eldest daughter Patty to be with our Lord. She was born in Calumet, on March 9, 1920, the daughter of Joseph and Delia Harris, she graduated from local schools in Calumet. She was married to Phillip “Phil” Verville on September 28, 1940. He preceded her in death on May 21, 2001. She was a homemaker all her life. She enjoyed her family, volunteering for her church, playing bridge was a passion, as was knitting, coffee clutching at the Kaleva with her friends, & baking treats for her grandchildren. She was a member of the Church of the Resurrection in Hancock and former altar society member. Besides her parents and husband she was preceded in death by her oldest daughter Patricia Ann O’Hagan, (Patrick) of Florida and sister Betty McCarthy. She is survived by one sister Vera Stellberg, sons Michael of Hancock and Phillip II (Mary Anne) of Hancock, daughter Mary (Paul) Babcock of Sheboygan Falls, WI, 7 grandchildren, and 9 great grandchildren. The Mass of Christian Burial will be celebrated at 11:00 on Tuesday, December 4, 2018 at the Church of the Resurrection. Visitation will be one hour before mass. Burial will be at a private service in late spring in 2019. The O’Neill-Dennis Funeral Home of Hancock is assisting with the arrangements. To leave online condolences, please go to www.oneilldennisfh.com. Memorials may to directed to the charity of your choice in the name of Mary Frances Verville.